Our Model for Translation Quality | Language Solutions, Inc.
Our Voice of the Customer results showed that Translation Quality and Accuracy is one of the main reasons our clients choose us over other vendors. Our relationship is built on trust and appreciation of the organization and control we have over the quality that we deliver. However, translation quality doesn’t come easy. We have built our quality model around best practices and models from both inside and outside our industry in order to maintain the highest standards. Our clients are the beginning point of the translation quality, which is why we focus on Localization Maturity. 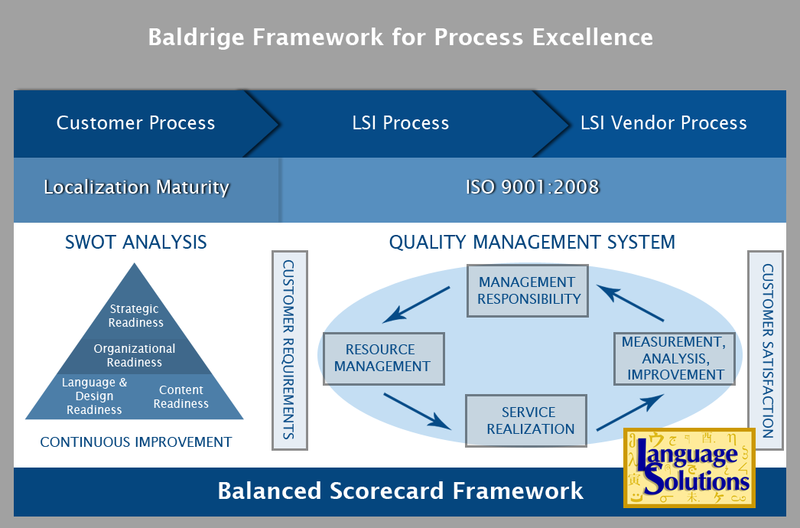 Internally, we are ISO 9001:2008 certified and follow Baldrige Principles for Performance Excellence. We ensure that every project is closed with a project audit and continuously look for cost and processs efficiencies that we can pass on to our clients as well as implement inhouse. We continuously train our vendors in the latest software and processes. We use corrective and preventative actions in order to facilitate continuous improvement. Our vendors love to work with us and as part of our ISO 9001:2008 standards, they are chosen specifically for the task. We pay fair wages to our translators (we do not barter them down to cheap rates) and support them with appropriate training of software and process best practices to become better professionals in their industry. We are committed to their growth and development.